The Truth about Surgical Tech Jobs! Very often you may have read my newsletters and web pages and you may have noticed that I enjoy sharing my insights on an occasional email I've received from questions that I "OFTEN" get. WELL, the particular subject I'm writing about today is something that I receive emails on daily. A lot of the emails I receive are very friendly questions about how one can find a job as a new grad. And, some of the emails include comments like: "there just aren't any jobs out there for surgical techs" and "I cant believe I got into this field". Well listen up, because I have GOOD NEWS! First of all, let me say, I'm not picking on anybody who sent me an email and I thoroughly encourage you to write in no matter how you feel or what you'd like to express to me. I REALLY LOVE hearing from you and I'm always here to try to help you in any way possible!!! Now, if you came to this page and are actually going to read the entire letter here, you are obviously the type of person who has what it takes to tackle what I'm about to say regarding the surgical tech job market. AND you are probably also one of those people who doesn't focus on the "nobody will..."
What I mean by that is that I literally have thousands of newsletter subscribers who get the same newsletter you got that brought you to this page. And among the thousands of newsletter subscribers who receive these newsletters, odds are that a certain percentage will automatically delete the email or simply not take the next step, visit this page, and read something that may help them make the change they are looking for. Like I said, keep reading and I will share some of my wisdom about the surgical tech job market with you and hopefully help you take the next step to finding a JOB. We all know the economy is in a horrible state. Well, every single industry is feeling the financial pinch. Bottom line: the economy is in a really, REALLY bad state right now. is YOU are in a field that is always going to be in demand no matter how bad the economy is or gets. And that one simple step is: DO NOT GIVE UP & USE THE PLAN ON THIS PAGE! Please let me explain...it really does get much better! Now I know this (the do not give up part) doesn't sound very easy especially when you need to make that car payment or pay the rent, or put food on the table, and especially when you feel like you just put yourself in a hole after you spent thousands of dollars on a surgical tech education with no job in site... and then the next thing you know your student loan payments are due and you still don't have a job. Just do not stop trying to get that first job in the operating room or doctors office or surgery center or central supply or with the instrument company or wherever your surgical tech education can get your foot in the door. There were times in my career where I had to take a second job at the local video store in order to make ends meet. I even did a little gig as a store detective at the mall in order to be able to afford to eat. There was even a time I had to work for a temp agency as a hospital supply tech in the basement of a hospital delivering supplies around the facility. Sooo, believe me, I know what it's like in tough times and yet I still never gave up! Listen my friends, when you are looking for that first surgical tech position and the doors keep shutting in your face, smile and say thank you because that door was not meant to be open at that particular time. Above all you cannot get discouraged and throw in the towel. You have to prepare yourself and keep knocking on those doors. Believe me, operating rooms need you!!! IF they don't need you right this very moment, they will need you at some point down the road. And if you keep knocking on the door they will eventually open. AND if you have to live on peanut butter and Doritos in the mean time, so be it. I cant emphasize the do not give up part enough. If you are still reading you obviously have what it takes to be successful. Most people find it easier to exit out of this page rather than to hear the truth. YOU, on the other hand, are looking for more...so you are truly unique. 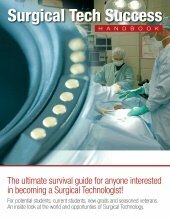 If you'll notice, the name of my site is surgical tech SUCCESS! Success is attainable by every single person out there. Today... I personally feel successful, and I also feel success is all relative. As for me, a few reasons I feel successful, besides being the founder of SurgicalTechSuccess, are because; I'm not living in my Jeep anymore, I don't buy Doritos and peanut butter on my gas card anymore :) I have a roof over my head, I have people who love me, I have a wonderful woman in my life, I have two awesome dogs, I have an awesome church family, and I have the ability to try to make a difference in at least one persons life every single day. What are your "I HAVE's"??? Hey, some of you may not like hearing the truth, but if you have known me for more than a day, you know I speak from the heart AND I SPEAK from the decades of experience I've had in and around the world of surgery. If you really want to find a job as a surgical tech without any experience, arm yourself with every single tool available and get in the battle. Finding a job is a battle these days for every single industry out there. Of course I'm trying to make you laugh little here but the bottom line is the job market is tough for every single profession out there! BUT, AGAIN...you are in a profession with specialized skills and somebody will give you a chance as long as you don't give up. Don't let them forget you are available, & never stop trying!!! The Surgical Techs who stop trying are the one's who find themselves working at the mall complaining about the money they wasted on surgical tech school while their resume sits in the computer without a single person knowing they are still available. There are all kinds of FREE tools on this website that you can utilize! From free business card makers to tips & resources about finding a job. I even wrote a couple of detailed newsletters about how you can make BIG BUCKS as a surgical tech. My surgical tech education opened doors that most other college educations would not have even budged. If I can do it YOU CAN DO IT too!!! Use what you have from where you are and keep taking that next step forward. The reality is that finding your first job can be a challenge but it is definitely possible. If you're still in school prepare yourself now with every single tool I've mentioned in this & previous newsletters. Trust me, I've been in & around the surgical world before many of you were even born. It's up to you to believe and press forward! If employers aren't looking for you, let them know you are on the playing field and keep yourself focused on the goal. Keep knocking my friends and they will eventually answer. My goal is to help every one of you succeed, but the reality is, if my words touch just one person and makes a difference for just one person, I'm a lucky man.